A constellation of disruptive factors looms on the horizon: Brexit, U.S. elections and the possibility of a Donald Trump presidency, then there are the unusual events in Turkey this summer. The “black swan” events are multiplying and challenge established conventions. This Special Report is a unique collection of views on key security issues facing the North Atlantic Alliance and its members. 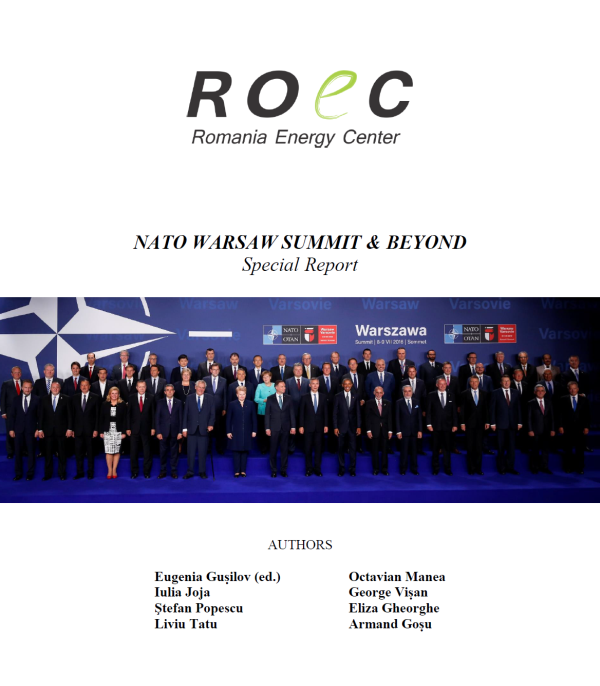 The architecture of the Report is designed around four topics: the A2/AD issue after the Warsaw Summit, a discussion of ballistic missile defense in Europe, nuclear deterrence and Turkey. The A2/AD bubble is a double-edged sword, argue Octavian Manea and Iulia Joja in chapter 1 which features an excellent discussion on access denial, decisions taken at the Warsaw Summit, and the 2nd offset strategy. The analysis provides context for some of the big lessons downloaded by the current top leadership at Pentagon in preparing itself for a new RMA. In chapter 2, the authors, George Visan and Stefan Popescu, focus on a topic of great interest to Romania – the ballistic missile defense shield (BMD). The presence of the shield, of American and multinational forces can create the temptation to sub-finance your own military forces and the authors caution host states to avoid the pitfall of complacency and fix deficiencies in the area of conventional military capacity. Moreover, their text provides valuable insight into differences in perception towards the BMD project which stem from different historical experiences and strategic cultures. Chapter 3 offers a bold look into a topic that is usually reserved for the analytical and military establishment of nuclear capable states. Going beyond basic deterrence is dangerous warn the authors of the chapter, Eliza Gheorghe and Liviu Tatu, who signal changes in nuclear postures of U.S. and Russia. In addition, the text offers a rare insight into the relation between the provider of security umbrella and protégées and cautions against the danger of dragging the patron, and ultimately the entire alliance, into an unwanted conflict. Finally, the last chapter is dedicated to events that unfolded in Turkey (a key NATO member state) this past summer: the coup, its aftermath, and impact on the country’s relations with the U.S., NATO and Russia. It pinpoints the role Turkey has in NATO, but also discusses the geopolitical ambitions which could dilute Turkey’s position in the Alliance going forward. What happens in Turkey next has a double significance, as it is a key country for both the Alliance Southern and Eastern Flanks. We hope you will find the report stimulating and thought provoking. Chapter 2 focuses on the NATO ballistic missile defense in Europe. It provides context for understanding the reason for its existence, its initial design (and subsequent amendment), it discusses issues that are less known to the general public such as missile defense economics or gaps in Romanian air defense systems. By default, the protection of the missile base at Deveselu falls to the host nation, Romania. Therefore, awareness of how well or ill-equipped is Romania to deal with potential cruise missiles strikes or air strikes (their concentration in the Black Sea is not accidental) against missile defense assets deployed on Romania’s territory is key. As is the understanding of how Russia is hedging against the U.S. missile defense deployments in Europe. Furthermore, this chapter offers a rare perspective on perception of the missile defense project. Much like in the story with the elephant and the blind men, Europe’s BMD is viewed differently, based on different historical experiences and strategic cultures. The concept of ‘strategic defense’ itself is perceived as an extra-European (American) one, since Europe has considered up until now tactical missile defense only. There is the American view, then there is Europe’s fragmented vision (with France at one end of the spectrum, pushing for greater European strategic autonomy, and the Eastern European host nations, at the other end, who see the BMD as an additional layer of security, on top of Art 5 guarantees). Finally, there is the Russian perception who fears any upset of the global strategic balance (i.e. any increase in the U.S. technological advantage), even if the BMD does not affect Russia’s land-based, underwater or nuclear deterrent.